In our search for salon-quality styled hair, a heated rotating brush answers all our prayers. These brushes provide an easy alternative to the difficult and tiring task of the dreaded blow dry. Hot air stylers give volume and body whilst smoothing straight hair or creating gorgeous curls. The key to these products is that they provide hot air for drying whilst simultaneously working as a styling tool. Like the heated straightening brush seen on TV, a hot brush styler can tame even the most frizzy and unruly hair, leaving you looking FABULOUS for a night on the town. So what is the best hot air brush and styler? As a lover of big, voluminous hair, I am going to help you achieve that salon-quality results by reviewing the best brushes and stylers! Keep reading to find out our top picks. This is definitely a less expensive option. But, is it any good? To be honest, I was pretty disappointed the first time I used it. But just like any new appliance, you will need to give yourself time to get the hang of it. Once you learn the techniques, you’ll find yourself loving this brush! It’s got two different types of bristles, there is a longer one and set with some rounded ends. The other one is short with soft bristles. This curling brush actually holds my hair nicely, letting my hair glide through the bristles. It does not entangle the hair. In fact, it can release effortlessly without ending with kinked ends or fuzz. There is no point using the John Frieda rotating hair brush dryer if your hair is still quite wet, because the power isn’t very strong, so it would take forever. There are a couple of good things about it not getting too hot, though. You can wrap your hair around the brush head easily without burning your hand, and you don’t need to worry about it burning your head whilst you hold to set. The curl I did myself lasted all day. My hair looked like it was blow dried by my hairdresser just by using this hair styler. Because of the gentle heat, I felt that the John Frieda hot air styler was doing less damage than my straighteners or some other heated brush stylers. Best for All hair lengths. Tip: Use in between hair washings for a quick boost of oomph. This is seriously an amazing product. It gives you a totally voluminous finish. Your hair is left with natural shine with no frizz. In many ways, this is similar to the Conair hot curling brush. But, the main benefit I found when comparing the two is that the Babyliss hot air brush has around double the amount of power in the airflow. This speeds up the whole process. The Babyliss has a metal barrel, and I found the bristles gripped my hair better than the Conair. Both are brilliant, but if you can afford to pay extra for the Babyliss, I think it’s definitely worth it. The barrel is quite large. It 2 inches wide and that’s just the barrel, not counting the brush bristles. The large barrel makes this styler great for shoulder length hair or longer. This is also the best hot air brush for thick hair. Just remember, the thicker your hair, the more you will want to rough dry with your hairdryer first. My hair looks perfect after I use this, and I don’t have to worry about burning my head. It saves me so much time, I love it! This device cuts my blow drying time in half and makes my hair smoother than I’ve ever gotten it at home. It looks like I just came from the salon. Best for: Bobs or long hair. Tip: For extra softness, use a leave-in conditioner on damp hair before drying. This styler is a very popular choice and a highly rated product on Amazon. It’s super easy to use and is brilliant for speedy styling. It’s a big curls brush, so it’s not going to give you defined curls but it does give you a lot of volume. The Infiniti Pro has three heat settings – low, high, and cool. I find it works best if I rough dry my hair so it is 80% dry with my hair dryer first. I then work through fairly large sections at a time with the heated brush on high. It spins in both directions, you simply hold the correct button down and spin inwards for curling under or outwards for flicks. If you don’t want it to twist so fast, then just pulse by repeatedly pressing the button rather than holding it down. Easy and fast to use. Great for creating volume and flicks! This styler causes less damage than a regular hairdryer because it works faster, so your hair spends less time under the heat. I love how soft and silky my hair feels after I use this. Tip: For your bangs, spin inwards over your forehead, then part to style. Do you have thin and fine hair that always seems to end up in a knot? Then, this is the right heated brush for you. If you hate tangles as much as I do, you’ll instantly fall in love with the Helen of Troy Curling Brush. It dries and styles your hair without adding any uncomfortable tangles. Not only will the amount of volume blow you away, you’ll be impressed with its staying power! I highly recommend The Helen of Troy. Looking for an incredibly affordable option? 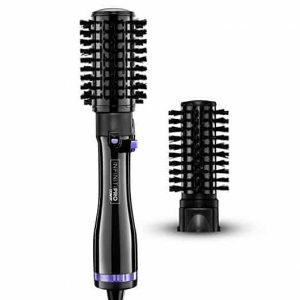 The Ionic Tourmaline hot brush styler from Hot Tools is a great value for its price point. The ionic generator produces negative ions which work to restore your hair’s ionic balance, improving its overall health and adding impressive shine. If you love how your hair looks after an expensive blowout, this tool can give you the same look for a fraction of the price. All in the comfort of your own home. Now here’s a product that will not leave you feeling disappointed. No matter how thick or curly your hair is, the Revlon Shine is a top product that will leave your hair dry, free of frizz, and full of volume. This Revlon hot air brush has three different heat settings along with three different speed settings. So, you can customize your styling experience to match your hair ’s needs. It even has a cool setting to help set your hair and prevent damage. And with a great brand behind it, you’ll be satisfied and confident with your Revlon hot brush styler for years to come. I really love this round brush blow dryer. It smooths, straightens, gives body, and can even add curls or waves if desired! What more could you possibly want from a hair styler? It has ceramic and ionic dual heat technology for quick and even heat that infuses body and shine and creates frizz-free hair for all textures. This heated brush even comes in a nice bag and is available in a choice of colors and sizes. This styler does not rotate like the others I have told you about, meaning there’s a bit more work involved. The good thing about this is you have complete control. I’m so happy with this hot brush styler. It’s a fantastic curler, I love how you can create beautiful waves that last all day. It’s well made and easy to handle, with the bonus of automatic shut off after an hour. If you’re someone who is a bit scared of flat irons after previously burning yourself, then you should try this. Start from the root of your hair and wrap around the brush. Glide through the hair at a reasonable pace, twisting around in order to get the style you desire. It sounds crazy, but this device actually left my hair in better condition than when I started. After a little practice, you’ll love it! Out of all the devices I have reviewed today, this is definitely the best hot air brush for fine hair. Best for: All hair types but especially fine to medium hair. Tip: Use lower heat setting for fine hair and turn up the heat for thick course hair. This has a 1 inch barrel, so it’s perfect for shorter styles when you still want to create some curl. I found it can sometimes tangle a bit. However, as with all hot air stylers, the more you use it the easier it gets. 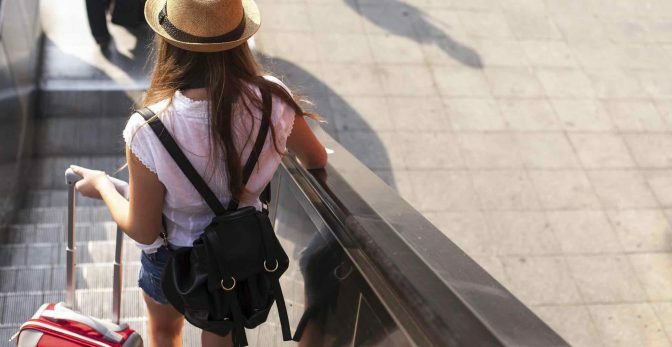 This styler is also nice and lightweight, so it’s great for taking on trips as it won’t weigh your bag down. You can use this device on towel dried hair if it’s short. If you find it takes too long, then rough dry to 50% with a hairdryer first. The curl release feature is a nice touch. My mom swears by this product. She’s had several over the years as they don’t last forever, but for the price they are worth it! Expect it to last you around 2 years with regular use. Best for: Short fine hair. Tip: Put a little bit of hairspray on and it will last you for the whole day. Well, I wasn’t sure what to expect from this strange looking little contraption. But I have to admit, I am so impressed with the difference it made to my hair! When I use this product, my hair is noticeably silkier, shinier, and bouncier, with healthy waves that hold. The heated air dries it from the ‘inside out,’ which styles it at the same time, eliminating my previous need for the use of a curling iron or hot rollers to create soft waves/curls after drying. There has to be something to ‘ionic’ hairdryers that really DOES make a difference. Not only is this a really neat gadget that makes styling easier, but ionic is definitely better. My hair condition has really improved since I started using this. The Conair Ceramic Ionic heated brush is ideal for finishing many hairstyles. While it is 1000 watt power makes it impractical as your only drying tool if you have longer hair, it does a fantastic job on shorter, cropped styles. Best for: Short to medium-length fine hair. Tip: If you’re someone who doesn’t like to spend too much time on your hair, this is a good investment to use for simply styling hair around the face. Just like most heated styling tools, a bit of practice is all you’ll need to style your hair like the pros. If you’ve never used a product like this before, you’ll notice that it’s similar to flat iron. Follow this easy tutorial to become better acquainted with your new styling device. 1. Plug in your round brush blow dryer and allow it to heat up. Spray hair with a heat protecting product. With most hot brushes your hair can be fairly wet before using them, but some users prefer to dry their hair with a blow dryer first. Try it both ways to see which works best for you and your hair type. 2. To begin, simply brush your hair with the heated brush. As your hair begins to dry, you can start adding curls and volume. To do this, wrap a section of hair around the brush and begin to slowly move the brush down, taking care to go slowly enough to prevent tangles but quickly enough to avoid overheating the hair. 3. Repeat on all sections of your hair. When you reach the end, you will be left with smooth, sleek hair that is full of volume and bouncy curls at the end. Finish with a little hair spray. One of the main problems when it comes to styling fine hair is that it’s prone to tangles. When you try to remove the tangles, you usually end up removing the style that you just worked so hard to create. Be on the lookout for a soft or medium bristle that won’t yank or pull at your hair too much. Your hot curling brush should also have multiple heat settings to avoid damaging your finer hair. If you’re looking for a specific model, the Helen of Troy Curling Brush is ideal for those with thinner and finer hair. It’s definitely designed to give those with fine hair the ability to style their hair with just as much ease as everyone else. In fact, if your hair is classified as thick or wavy, you may want to steer clear of this particular product. If you have thick hair, you know how tricky it can be to find a heated styling tool that will accommodate your lustrous locks. Luckily, you have more freedom when it comes to specifics. For example, thicker hair works well with many different types of bristle materials and sizes. You will want to make sure that your curls brush heats up well for even distribution. 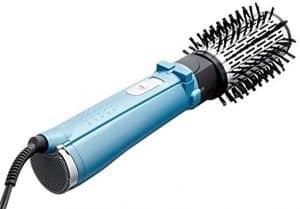 A great blow dry brush styler to try out if you find yourself struggling with finding a perfect match is the Jilbere hot brush styler, which features a 1.25-inch barrel that will accommodate thicker sections of hair while evenly distributing heat. When you’re rocking a shorter hairstyle, you want to maximize your volume while keeping your hair shiny and healthy. So when you’re on the hunt for a curling brush, you’ll want to make sure that the barrel is the correct size and that the barrel type will prevent frizz. A great place to start is the John Frieda hot air brush. It’s available in two different sizes. The 1-inch is perfect for short hair, but if you’re looking for more volume and less emphasis on curl, the 1.5-inch is terrific. As if there weren’t enough choices when it comes to finding your perfect product, you’ll also be bombarded with all the different types of materials used in their construction. So what’s the difference? Here’s the basic breakdown. Ceramic is the most common material used in hot airbrushes on the market today. The material is both durable and affordable, so it makes sense for the standard product and standard customer. In other words, more expensive and high-quality hot air styling tools will probably not use ceramic, but if you’re using your hot brush with standard expectations, there’s nothing wrong with purchasing a more affordable option featuring this material. A ceramic heated brush is ideal for both thin and thick hair. It’s great for protecting healthy hair and can even help the healing process if your hair is a bit damaged. You can also use a ceramic hot hairbrush on a daily basis. If you’re looking for a hot brush that has a bit more to offer, a tourmaline ceramic plate is a way to go. Tourmaline is a crystal-born silicate material (say what?) that helps to lock more moisture into your hair than ever before. This means that your hair will be smoother, silkier and overall healthier without annoying frizz or flyaways. Tourmaline also helps to generate infrared heat, which will keep your hair from taking on static throughout the day. Overall, tourmaline can help improve the current condition of your hair when you use your hot brush according to its instructions. Tourmaline ceramic hot air brushes are great for all types of hair and all levels of hair health. You can use them on a daily basis in the comfort of your own home, but they’re also a favorite product for professional hairstyles to take on the go. If you’re looking to get the most from your blow dryer styling brush, and the price isn’t a concern, titanium is what you’re after. 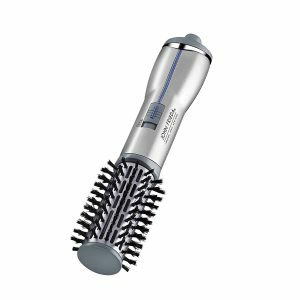 Known for its strength, durability and impressive heat conductivity, a titanium hot hair brush will provide you with outstanding results, no matter the type of hair that you’re working with. This makes it a great option for professional hair stylists. Titanium hot air brushes are a must for thick or coarse hair but will work on normal hair as well. Because of their high-performance levels and increased heat levels, titanium products should only be used by professionals or those who are incredibly experienced with these types of products, to avoid damage to the hair. In other words, your first rotating brush probably shouldn’t be made with titanium. Instead, titanium should be a material that you work up to. If this review has taught you anything so far, it’s that no two hot air brushes are created the same. In fact, there are a few different subcategories when it comes to hot air stylers. Knowing the difference can help you narrow down your choices when it comes to picking your ideal styling tool. Don’t have time to wait for heat? A hot iron brush is made to heat up incredibly fast and provide a uniform temperature throughout the barrel, resulting in professional-looking curls. These types of hot air brushes take a little getting used to and should be used with caution on thin hair because of their extreme temperatures. Need to save time in the morning? 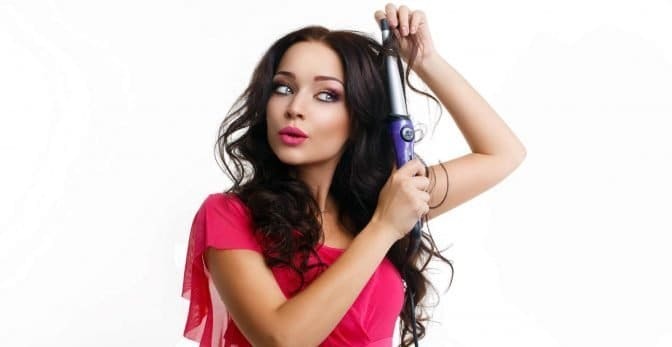 A curling hot air brush is made to curl and dry your hair at the same time. You’ll want to make sure that you’re purchasing one with an ideal heat level for your type of hair, to get the most out of it in the shortest amount of time. With a little practice, a curling brush can cut your morning hair routine down to just a few minutes. If your main goal is volume, a rotating hair brush dryer can help you reach new heights. Just make sure that the barrel size is ideal for your type of hair and will prevent tangles, which can become much more dangerous with a rotating brush. Different bristles on your hot air brush can mean different things. Take a look at the pros and cons of these common bristle types. Keep in mind that some hot brushes can have a combination of bristle types. Boar bristles can help to evenly distribute oils throughout your hair, leaving behind an impressive shine. Different hair types respond to boar bristles differently, so this may or may not be the best option for your hair type. You’ll find boar bristles on a rotating hot air brush quite often. Nylon bristles are often added as a secondary bristle type to hot airbrushes. These bristles add a bit of strength and shape, which is important when trying to create volume and curls. Plastic bristles are common on hot air stylers. They’re affordable for a manufacturer to use and are also incredibly durable. They may not produce as much shine, but they’re great for keeping hair tangle free. You should be regularly cleaning your curls brush to get the most out of it. After each use, remove any hair that might be caught in the bristles. When the heated rotating brush is cool enough, wipe it down with a damp cloth to remove any product build up. Be sure to follow the individual cleaning instructions included with your product. Many include a removable filter that should be routinely cleaned to prevent your product from overheating. There you go. I know that that there are a lot of hot air brush reviews out there. But, I hope you found this one useful. There should be enough information here to help you work out which is the best hot air brush for you and your hair. There are so many advantages to using a hot air styler. The hot air styler is a necessity for Glamorous girls on the go. Order yours today and I promise you will never look back. Feel free to leave a comment to let me know how you get on with yours. Thorough review & great additional information! Lovely job! Thank you! It’s really helpful! Thank you so much.? Hi… I have been using flat iron straighteners for two years and I have enough knowledge to use it in a proper way. Now I have got brush model straightener as a gift and I still suffer using it in a right way. All the information above are really helpful I have got a new idea about these devices and so now I realize that I have got a unfit brush for my hair. So gonna get a new one soon. Thank you for your support.